Blueberries were on sale last week at my neighborhood grocery store. So I picked up 2 pints. While scouting around the internet for something nice to make, I came across this recipe for a clafouti. This was something new to me but it seemed simple and straightforward enough, and so I was willing to try it out. Without making too many changes to the original recipe, this is what I did. Preheat the oven to 350 degrees F. Grease an 8 x 8 inch baking dish. 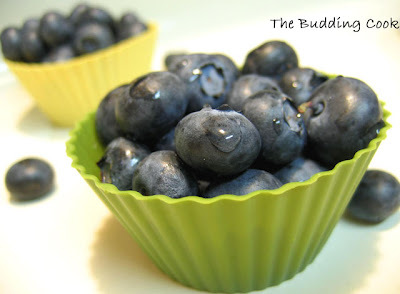 Arrange the blueberries in the dish in a single layer. Place the eggs in a mixing bowl and whisk until they begin to turn light and fluffy, and foam. Stir in the sugar and continue whisking. Add the milk, vanilla extract, lemon zest, salt, and flour, one at a time, until the mixture is light and airy. Beat until well combined. Pour the batter over the blueberries to cover evenly. Remove from oven and cool slightly. Sprinkle with powdered sugar, cut into wedges and serve warm. I had no idea what to expect since I'd never tasted a clafouti before but judging from the taste I'd say that I did a pretty decent job with my very first one. I think it's great not only as a dessert but would also make for a healthy and filling breakfast, albeit a little sweet, considering that it’s basically just a baked fruit pancake. So, off this goes to the WTSIM Berried Treasure event and AWED: France. I'd like to try this in future, finish it up and then let out a 'burp' :) Nice recipe! blueberry clafoutis...looks deliciious but generally somethe clafoutis can taste eggy..that is the only time I don't like it..
lovely blueberries! :-) nice job! 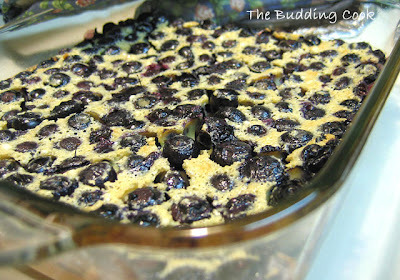 I love clafoutis and blueberries even more so this looks delish to me! I've been contemplating a cherry clafoutis forever but don't know what to expect...Yours' does look so good! I'm envious of your 2 pints of blueberries!!! Great post!! That looks great... beautifully studded with blueberries. I've not had clafouti before either but was contemplating a cherry one since I have so many cherries on hand. I made a vegan version but did not post it as I am really not sure about the taste of a cloufatis - whether to expect it to be cakey or custardy! Could you let me know? I love the berry treasure on yours:) Lovely entry! How I wish we had all these berries here in India! There's so much you can do with them. I have never tried Clafouti before. Your recipe looks fantastic. Gorgeous! I just made a cherry clafouti and would love to try this blueberry version, as blueberries are my favorite berry. Never eaten this or made it either. But I think I should, it looks pretty good. Cool - this looks like a great mid morning snack! Looks yum, But We dont get fresh Berries here in India ...Other than berries can we use other fruits , not sure about this also ..
anyways this surely looks very appetizing . A berry clafouti breakfast would surely start the day off right. I have not tasted this before but the amount of blueberries in there? 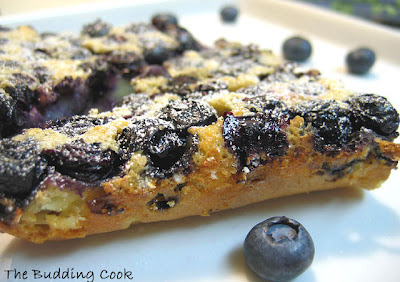 To die for..
Blueberry clafouti sounds like a great idea! Rachel- I know what you mean 'cos I looked up a few different recipes and most of them mentioned what you were talking about. Keepng all that in mind, I added some extra vanilla extract and also threw in some lemon zest. I love your zebra cake...looks like a work of art! Meeta- welcome, and thanks for stopping by! :D.
Now that I know what to expect clofouti-wise, I would like to try the traditional cherry one too. Syrie- welcome! thanks for visiting.:D. Thank you! Nags- :D. I don't think I'd have bought them if they hadn't been on sale. Lisa- thank you! :D I would love to see your cherry clafouti. Did you post that already? I still had a pint of blueberries remaining after this! Loved your blueberry dish, it looks mouth watering. clafouti is very new to me...love blue berries...these look gr8..ur 1st click is aweome...such fresh looking berries...and cloufouti looks yumm..
looks good. berries and custard, nice. Thanks TBC, I am doing good.... India trip was hectic...but memorable! I am back to blogging...presently working with my layout, its going crazy! Wow....this dish looks so good! Love the pics. I've never had clafouti before. So much freshness in this dessert! It's nice to see you here. I hope you are fine now. I can understand what you mean by hectic...so much to do, so many places/relatives to visit and so little time! Jeanne- thank you! :) I checked out your clafouti(s) too. There it is! Been looking for it all over your blog. Like you said this is almost like a baked pancake. Sound great to me, and wonder what changes I would even try making to this!!! No butter, and it is pretty healthy to me! Anon- I'm glad you think so! Just made the clafoutis, as per your recipe...delicious! Love the addition of lemon zest. Will definitely make again... Thank you! Anon- I'm really glad to hear that the recipe worked for you! Thank you for letting me know. This looks amazing! I love blueberries.